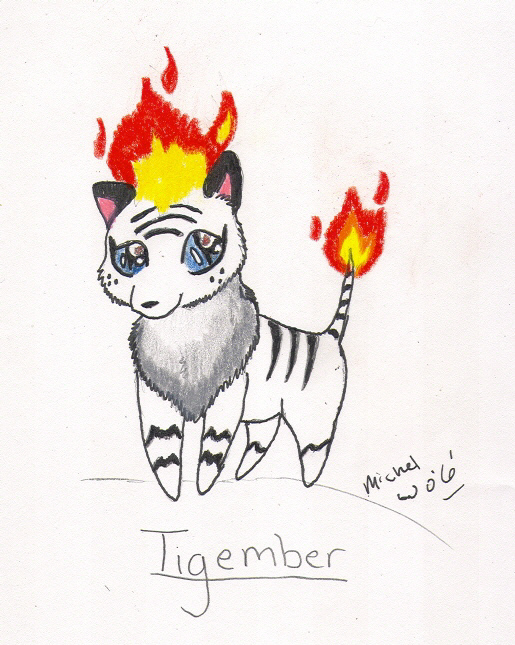 One of 2 entries for Twinstar's Make Your Own Pokemon Contest. Description: Illusive and often shy, Tigember tend to be solitary little creatures, prefering to live in remote territories alone or coupled with one of it's own; often a sibling. As this Pokemon gets stronger, the flame on its head begins to die. Hot embers falling from the head eventually fall into the soft down on Tigember's neck, igniting it. Once this happens, Tigember will evolve into Blaziger.